Why dance in church? Is it biblical? This past weekend, I was blessed with the opportunity to meet with the Pastor and the Children’s Ministry Director my church. They had gathered several people who love dance to discuss the possibility of incorporating dance at our church, beginning with children. This was an answer to prayer. It was such a gift to have these leaders come to me and to ask me to share about dance with them. I have been ministering outside my church in dance through workshops and classes this past year, but have not danced in my church. It has been hard to imagine dance being welcome in this church. There are just one or two people who raise their hands in worship. Our Pastor and Worship Leader are very intentional to avoid or minimize anything that draws attention to the leader or a specific person. They do this because they want the congregation’s attention focused on the Lord and not the leaders, which I highly respect. The worship team leads from the side of platform and have said that they want to be “invisible” for the same reason. I appreciate their hearts and their humility. Nonetheless, you can see how it would be hard to see how dancers could lead worship, since the goal is for leaders to be invisible. As dancers, our goal also is to point to the Lord and not to ourselves, but we use a visual art to do this. In addition, the denomination operates under what is called the “regulative principle,” which basically states that we don’t incorporate anything in the worship service that is not expressly prescribed by scripture. So, if dance is to be incorporated in corporate worship, the Pastor and elders need to have solid theological grounds for doing so. 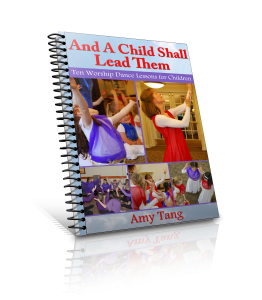 Author AmyPosted on July 30, 2015 July 30, 2017 Categories Biblical teaching, Dance Ministry LeadershipTags biblical basis for dance, corporate movement, dance in church, dance in the bible, dance theology, praise dance, regulative principle, theology dance, theology of dance, worship dance9 Comments on Why dance in church? Is it biblical? I had the complete joy recently to teach a six week dance class to students at Ecclesia Classes in Pasadena. We danced at Ecclesia’s Christmas party to Psalm 150, produced and sung by the Harrow Family on their album, A New Commandment. We also had the privilege of inviting the community to worship with us through movement after we danced. After all, this Psalm is a call to worship. 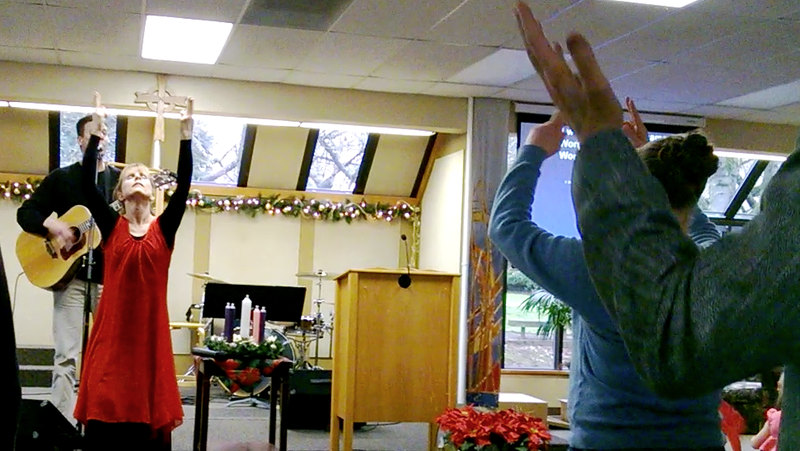 So, I taught the audience gestures to the song, “I Love You Lord,” and invited them to worship to the song with us. It was really moving to watch whole families moving in worship. Enjoy this dance and let it draw you to praise our Jesus, our creator, redeemer and shepherd. Please share in the comments about any dances you were able to share during the Christmas season and how they impacted those to whom you ministered. This was an amazing invitation because this would be totally new for our congregation. We are not a hand-raising, dancing congregation. We have a congregation of amazing servants, people who love Jesus, serve Him, and show their love for Him by loving each other in tangible ways. As Presbyterians, we value the life of the mind, and as a group, our congregation is more wary of very emotional or physical displays of affection in worship. Even having a team of dancers present worship dances is a stretch for some. So, to invite them to join the dance was entering new territory. I knew this was what God would want from me. Jocelyn Richard says that we know we are successful in worship dancing when the congregation joins the worship. So, I set aside the dance that I had on my mind and prayed about a worship song that was familiar to our congregation and lent itself to simple movements. 1. I began with a brief teaching. During the service, my pastor gave me five minutes to share a testimony of how God has worked in my life through dance over the last year and to do a very brief teaching on the biblical basis for dance in the bible and how dance has impacted my relationship with the Lord. 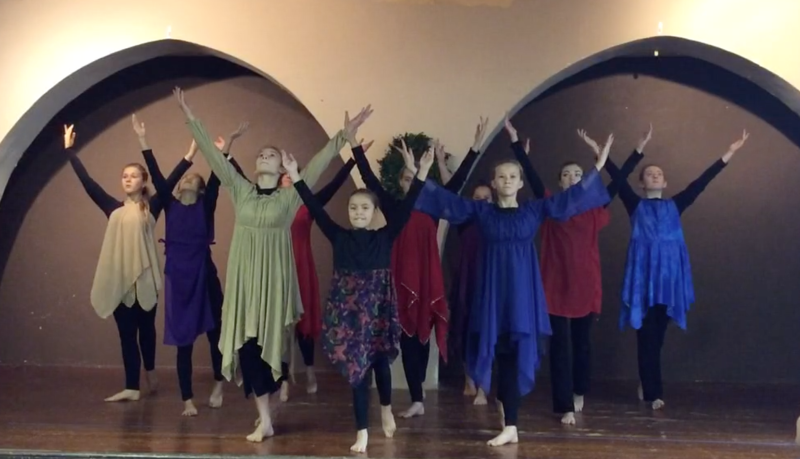 Sharing the biblical basis for dance helped open their minds to something new. Shared my own story helped open their hearts. 2.I chose a song that was familiar to the congregation and lent itself to movement. I didn’t want them to be focusing on learning new words or new music. We used a song we have worshiped to many times over. 3. I choreographed simple movements to the chorus for the congregation. Simple is the key. Lynn Hayden of Dancing for Him Ministries says, in her video “Corporate Worship” that when leading corporate worship, our movements should be simple, repetitive, and predictable (in contrast to choreographed movements for solos or for a team). I had to discipline myself to keep the motions simple. Even so, when I asked my husband how the experience was for him, he said, “Good, but I find I have to really concentrate to remember what to do.” That was a huge lesson for me for next time. Even what feels simple to me (and the enemy tells me is too simple, will be boring) is a stretch to someone learning it for the first time and wanting to worship as they do something new. So, keep it simple. 4. I taught the movements to the congregation and explained what they meant. 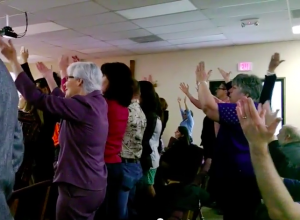 As I taught each gesture, I briefly told what we are saying (ie, “We put our hands by our mouth and extend them outwards, taking God’s blessing and releasing it,” and “We lift our hands up to the Lord as an expression of offering ourselves to him.”). A couple of people told me afterwards that this was an important part for them, that they appreciated knowing what the movements meant. 5. I danced the verses myself. This was at the suggestion of my friend and prayer partner Jennifer Bodde. This kept what I needed the congregation to do short and simple, and allowed for a time for them to receive ministry through the dance as well. 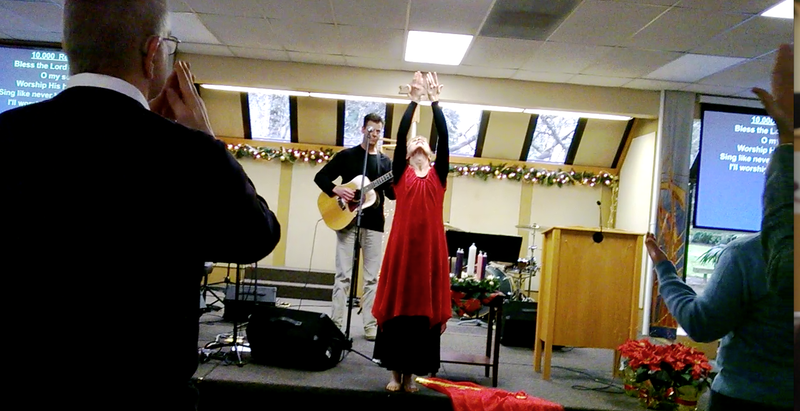 It was such a joy and a privilege to be able to share dance in this way with my congregation. A friend approached me afterwards, whom I didn’t know had any interest in dancing, and told me that she wants to attend a workshop I am holding in February in my church. It reminded me that while there are those for whom dancing is a stretch, there are also those waiting for an invitation to join in dance. What are your experiences in leading your congregation in movement? Please share in the comments.